If you have a vegetable garden and are looking for the right flowers to plant to keep critters away, we have some ideas for you. The following plants do a great job discouraging bugs and animals from getting into your vegetable garden. They are functional, for sure, but they look amazing too. So try some of these beauties in your veggie garden! Alyssum are gorgeous plants that spread along the ground and produce hundreds of tiny flowers. These blossoms bloom all season long, and they come in purple, white, and pink varieties. 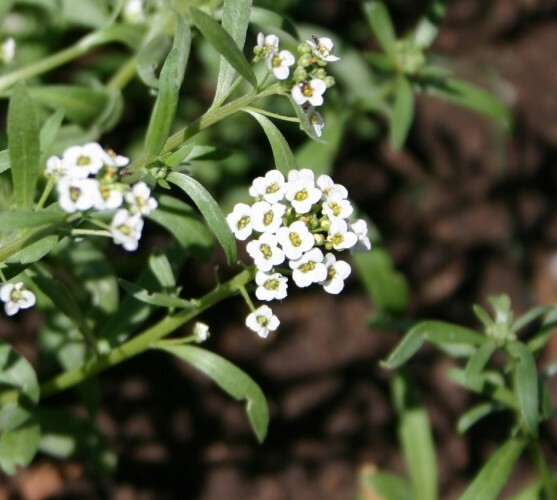 You can plant Alyssum with basil, lettuce, sprouting broccoli, and bush beans for a stunning aesthetic. Yellow and orange calendula flowers bring a bit of brightness to a cool-season vegetable garden of cabbage, carrots, collards, and kale. Tall calendula varieties can grow up to 18 inches tall, and they’re less prone to mildew, so we suggest you plant these in your garden. As a bonus, you can pluck your calendula petals to use in tea and in beauty products. There are two common types of cosmos: C. sulphureous, which comes in orange, red, and yellow and Cosmos bipinnatus, which produces the familiar pink and white flowers sometimes called “Sensation” mix. Cosmos keep creatures you don’t want near your flowers away. And, it attracts beneficial bugs and pretty birds. All of these flowers for a veggie garden are pretty common, which means you should be able to find them in your local nursery. But, if you can’t, you can always order them (or their seeds) online.